Sutton Library, on Lower Parade, is on the site of an earlier building, the Empress Cinema, which opened on January 1st 1923 and closed in July 1971. In a recent article, local historian Don McCollam has listed all the films screened at the cinema in 1923 - over 200 silent films. Don then turned his attention to a building in South Parade, which had been built to improve the public health of the town by providing slipper baths. You can read the results of his research in a new publication by the Sutton Coldfield Local History Research Group, “Proceedings volume 12”. This publication contains a number of other articles by local historians, ranging from new discoveries about historical uses of Sutton Park to the pace of house-building in Sutton, 1886-1929. This last article is by Janet Lillywhite, who has also contributed an account of domestic service to the volume This is a study of the servants who were employed in the big houses in Anchorage Road in the early years of the twentieth century, including the personal memories of someone whose mother was the housekeeper at a house called “Clovelly”. Oakhurst is the largest house in Anchorage Road, just over a hundred years old, and its history is traced in another article in the new volume - originally it was a private house, the Council acquired it for various uses in the Second World War; it then became a maternity home for a time, reverting to use as Sutton council offices until Sutton merged with Birmingham in 1974 - it now houses luxury apartments. To mark the centenary of the First World War, Alan Howells contributed a piece about Harry Patch, who died in 2009, entitled “The last of the First World War soldiers - his connection with Sutton Coldfield”, together with his own family’s war memories. The seventh local historian to have her research printed in the volume is Janet Jordan, whose book “Tall Tales from the Top of Trinity Hill” came out last year. This time she follows the fortunes of two nineteenth century schoolmasters, father and son, who established a thriving boarding school at Russell House (now demolished) in Walmley in the 1860s. You can buy a copy of Proceedings volume 12, which costs £5, at New Hall Mill on one of their Open Days - the next three are Monday May 25th, Sunday June 14th and Sunday July 12th. 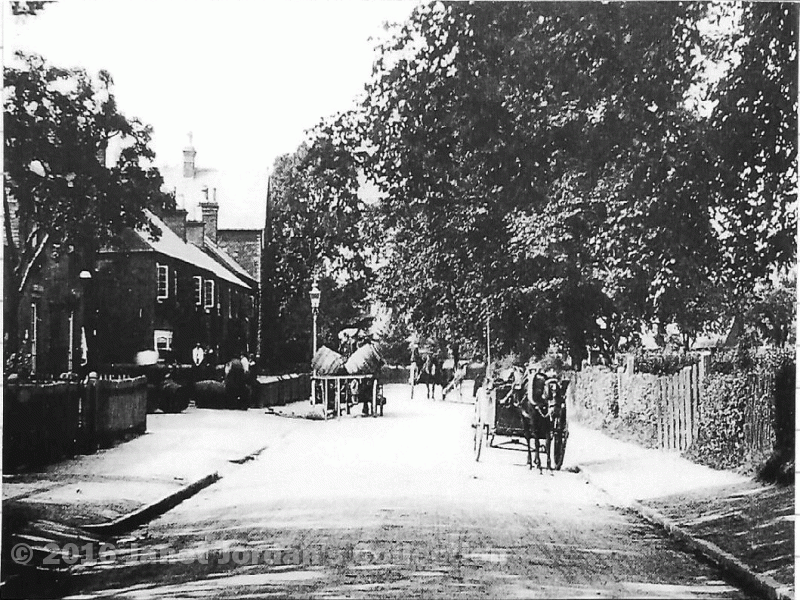 Walmley Village c.1900. Russell House, the large house behind the gas lamp, housed a boarding school in the 1860s.